You may or may not recognize this skirt from another post HERE where I was wearing it as a part of another outfit. Well now I am going to show you how I made this skirt. I am missing a few photos from the in between stages but I am sure you will be able to follow along just fine. 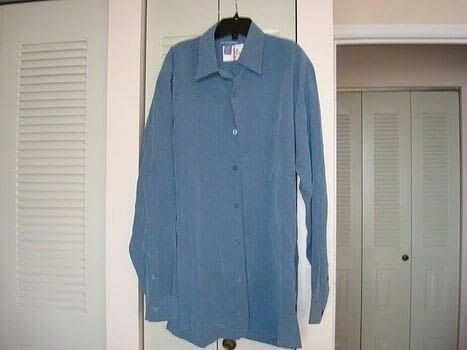 Of course first you will want to find an old men's shirt, I got mine at a garage sale for $1. Wash the shirt before you begin to sew as with any garage sale or thrift shop find. Next I held the shirt up against my waist (true waist) and made a little mark on the button placket to make sure the length would be just right. 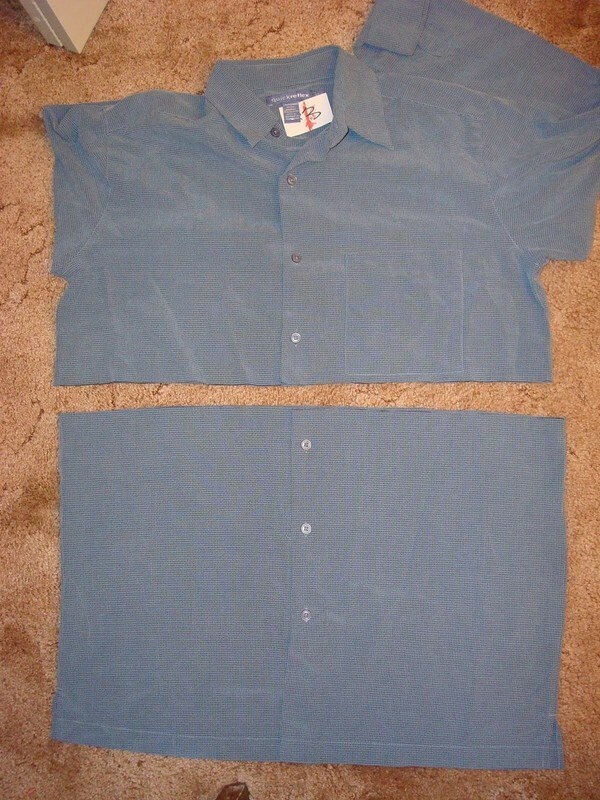 Once I had the shirt laid flat on the floor (or table if you want) I measured up in the middle and then on the sides to ensure an even length and then squared off a line. 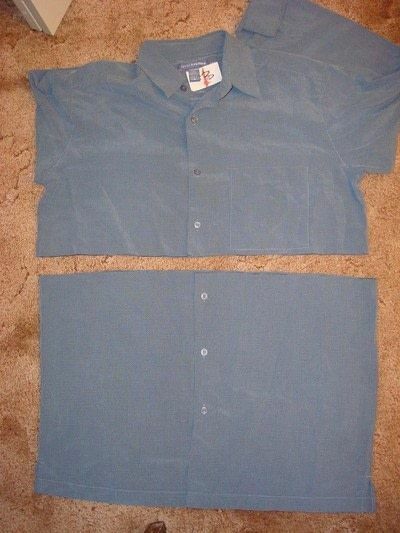 I then cut through both layers of the shirt. You may need to remove a front pocket from your shirt before doing this (I did). 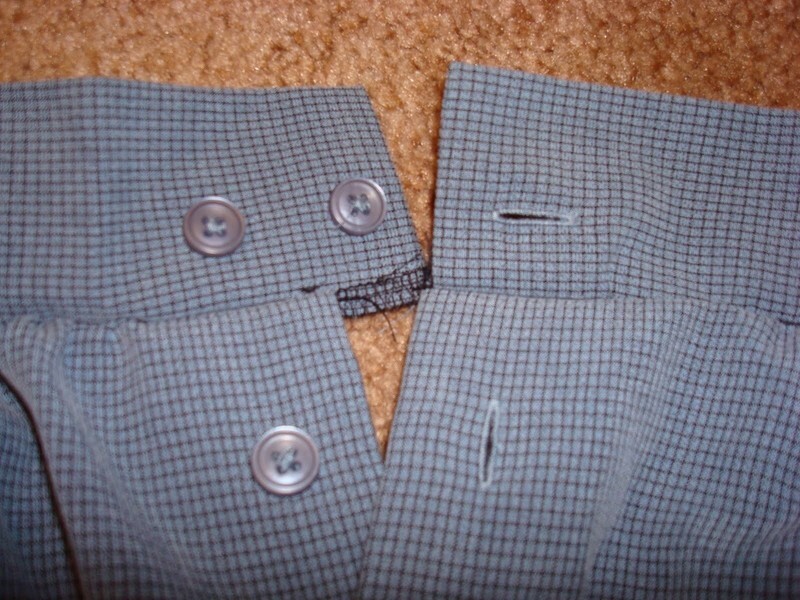 You will need to cut off the cuffs on the arms so that you can use these for the waistband. I cut off the entire arm and then the cuff. Measure your cuff width. Then measure it's length. You will need to measure your waist then subtract the measurements (lengths) of the two cuffs. The remaining number will be the length of strip you will need to cut to finish the waistband. You will need to cut a strip 10 inches by 5 inches (2 times the width of the cuff) plus whatever seam allowance you would like to add. I added a very minimal seam allowance as I was serging the seams together. You could also cut off the portion of the cuff you want to use and use extra fabric for the rest - your choice. I apologize for the lack of photos for these steps as I got too caught up in sewing!! Now you need to sew the cuffs to the extra strip. We make the strip double the width of the cuff as it will be folded over so the top edge of your waistband does not have any raw edges. 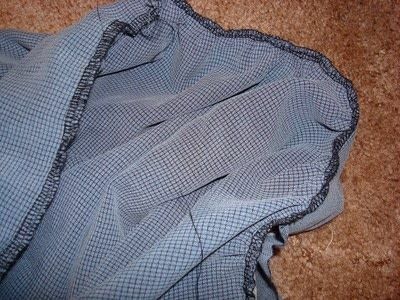 Once you have finished making the waistband into one piece you will need to sew the waistband to the skirt portion. The skirt portion will probably have to be gathered in to the waistband. Make sure the ends of your waistband are properly aligned before you start sewing. Trim any stray threads. 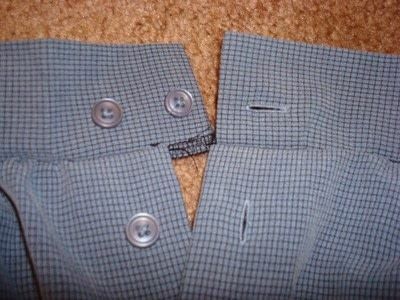 Now the reason that we used the cuffs for the waistband is so that you have a ready made button hole. You may have to change the placement of the button on the other side so that it fits properly. This can be done once you are trying the skirt on. You will notice in the following pictures that I added extra buttons all the way down the skirt in order to give it a more uniform appearance and keep it from looking so much like a men's dress shirt. I also stitched closed the bottom of the button placket so that it would not flap open awkwardly. 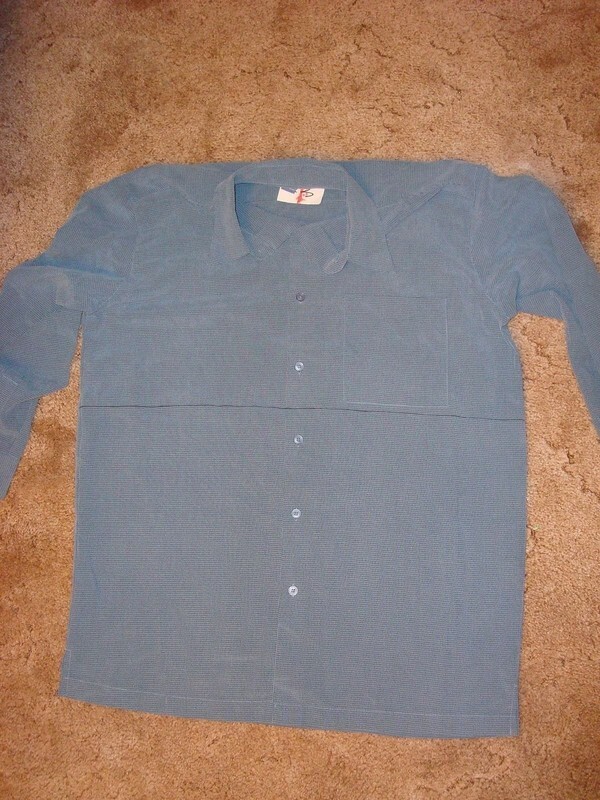 This was done by top stitching over the edge of the placket (it is almost imperceptible). 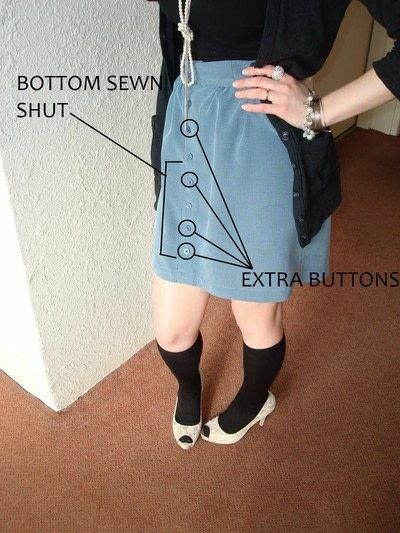 Try on your skirt and make any adjustments necessary. A brand new skirt! Voila! Clockhouse black tank top, Talula sweater, H&M socks, Nine West shoes, Thrift Store Bag (Daniela is the brand), Forever XI headband, Aldo necklace and assorted rings and bracelets. I apologize if I am not able to post anything new tomorrow as this week is going to be a busy one for us out at work, I will try my best though. I'm having a Link party for all fashion related DIY projects....come show off your DIY! Very cool...and even cooler that it is featured! Way to go! I've got to say, you're gorgeous. And, so is that skirt. I love it.